I explore these themes further here within the broader context of systems oriented approaches to complex problems, and the role “socio-technical systems” and platforms can play in supporting such capabilities. I also touch on the implications this has for institutions and programs seeking to support healthy, resilient people, communities and food systems. Before proceeding its worth noting the relevance of this topic to recent ECOP interest in both innovation and civil discourse as well as priorities in the Technology Outlook for Cooperative Extension 2016-2021 Horizon Report3. Particularly one of the most significant “wicked challenges” identified in the latter, teaching complex thinking, a capacity described as essential for people to understand the networked world in which they’re living and be able to tackle complex problems. The classical paradigm of science and engineering -the paradigm that has underlain modern professionalism -is not applicable to the problems of open societal systems, problems inherently wicked. Originally presented from the perspective of social policy planning the term has since been used to describe a host of modern challenges. That includes many Cooperative Extension and the Land Grant system as a whole are concerned with such as the “triple burden of malnutrition” (overnutrition, undernutrition or micronutrient deficiencies), invasive species and pest outbreaks, growing wealth disparities and climate change. Addressing the root causes and not just the symptoms of such issues requires an understanding of the complex systems from which they arise. Several transformative areas of scientific inquiry (illustrated below) arising over the last several decades are helping shed light on these. Drawing from, informing and linking several disciplines (including network science) this work is helping reveal and model the dynamic structures and relationships of a variety of different complex systems, such as cities, ecosystems, networks of neurons, social networks, power grids, and the internet. It’s been found these can give rise to “emergent” behaviors or intelligent structures (like bird swarms and termite mounds) not easily explained or predicted when looking solely at the aggregate abilities of their constituent elements, which might be quite limited at the individual level. Essentially systems where the whole is greater than the sum of its parts. Complexity science is also concerned with how those systems interact with their larger environment (often as nested, linked or overlapping systems of systems). Insights are now leading to the development of human designed systems like “robot swarms” exhibiting emergent behavior or “swarm intelligence” mimicking that found in the natural world. Research in these areas has led to the recognition of complex adaptive systems (CAS), collections of entities or “agents” whose patterns of interaction over time can feed back on the system in a way which informs future interactions. That includes emergent responses to a changing environment which can increase survivability of the macro-structure, as well as the self-organizing processes which give rise to such responses. Because these processes are distributed and spontaneous, the system is typically better able to survive or self-repair than one dependent on top down or external control/resources. Most relevant to my investigations1, the study of complex systems is also revealing reoccurring patterns in what could be called healthy or “fit” systems, including agrifood systems. These can exhibit the ability to 1) maintain functionality without fundamental changes (robustness), 2) recover or bounce back to a previous state (resilience), or 3) change (adapt) in the face of challenges, with examples found in a variety of social, ecological and technological situations. Systems able to maintain a balance of factors contributing to both resilience and efficiency, optimized for health and sustainability are said to exist within a “Window of Vitality”. So how might we consciously apply these principles to Land Grant institutions and programs? What are we to do when we realize that more often than not, the systems which we depend on and support are doing exactly what they were “designed” to do (intentionally or by default), sometimes at the expense of overall goals related to public health and well-being (possibly even while realizing individual programmatic outcomes)? A complexity perspective emphasizes the interrelated and systemic nature of issues…responses to the underlying issues may be less fragmented, more strategic, and more sustainable if they are linked and integrated across programs, organizations, systems, sectors, and areas of activity… The potential to generate cross-domain effects helps to bring stakeholders together around a common vision. They argue that community change actors experience complexity in two ways: by addressing complex problems and by working within complex adaptive systems. Their efforts can be improved by looking at problems (the book uses food deserts as one example) through the lens of complexity and employing adaptive leadership and management approaches (also mentioned in my last post). Political scientist Jenna Bednar uses a complex adaptive systems lens in exploring What Makes Some Institutions More Adaptable and Resilient to Changes in Their Environment than Others?6. In that publication she outlines several internal and external barriers to institutional change, even as the context in which they operate changes. She describes three design characteristics, diversity, modularity, and redundancy which can contribute to institutional fitness. Elsewhere7, Bednar and Scott Page argue that the collective intelligence of a community depends on network structures linking diverse perspectives, and that those structures may depend on institutional ensembles. Federal systems are presented by Bednar as being particularly robust. Such distributed structures offer systems level fitness advantages not found at the institution level, through phenomenon such as institutional complementarity, subsidiarity and “spillover”. This presents a compelling opportunity (and perhaps obligation) for embracing a CAS approach within our Land Grant system, something eXtension and federated bodies such as APLU, ECOP, AgNIC and USAIN are well positioned to champion and facilitate in coordination with federal agencies like the USDA. Donella Meadows, co-author of the groundbreaking 1972 book The Limits to Growth, pioneered the application of complex systems analysis toward sustainability challenges. In the paper Leverage Points: Places to Intervene in a System8 she outlined a series of specific system properties which could be targeted to proactively change a system (or even transform it entirely). People are not hungry in this rich country because there is too little food or money or organization. They are hungry because food, money, and organizations are not used for the purpose of once-and-for-all ending hunger. What is lacking is public commitment, or as some call it, political will. In terms of my own work within the Cornell University library system, with Cooperative Extension, and beyond, I’m particularly interested in how increasingly sophisticated information tools and systems can better effect positive social change through lever number 7, The structure of information flows (who does and does not have access to information), and the affect that might have on the other levers. IBIS guides the identification, structuring, and settling of issues raised by problem-solving groups, and provides information pertinent to the discourse. It is linked to conventional documentation systems but also activates other sources. Elements of the system are topics, issues, questions of fact, positions, arguments, and model problems. Though IBIS was introduced before the arrival of modern computing systems, use of these was definitely anticipated. A variety of computer assisted or web based tools supporting this kind of sense-making through argumentation process have indeed been developed by others since then (see this blog post for a great overview: From information to knowledge: the what and whence of issue based information systems). I’ll be exploring potential Cooperative Extension applications with other colleagues at the upcoming eXtension Diversity & Inclusion Issue Corps designathon next month in Cincinnati, looking at how structured approaches like this, “designed for conversation”, might support civil discourse around health, wealth and shared prosperity, leading to collaborative solutions to issues like hunger. This approach of bringing people, technology and information together in support emergent solutions is closely related to the concept of sociotechnical systems. The term was publicly introduced by Eric Trist and Ken Bamforth based on action research work with workers in English coal mines10. A key focus is on “joint optimization”, where both social and technical subsystems are optimized to promote organizational performance AND worker well-being. representative of a general approach to melding human intelligence and social technology to solve wicked social problems. It is a sociotechnical system writ large, that leverages not only the intelligence of thousands of community members, but also the knowledge and capabilities of many pre-existing human systems. The platform itself is merely a nexus in which we hope our vast potential collective intelligence may be applied to solve the problem of climate change. Work like this on “collective intelligence” platforms and systems draws from many of the same insights and biological models informing complexity science more broadly. For example a key mechanism supporting self-organization and the spontaneous emergence of complex, intelligent structures or behaviors without the need for central planning, control or even direct communication between agents is called stimergy. “Trace” left in the environment informs subsequent actions by the same and other agents which reinforce and build on each other. One example is the pheromone-marked trace ants leave, supporting networked discovery of and access to vital resources. Some are recognizing distinct similarities between this type of highly efficient sense-making in the natural world, and the role modern databases, wikis, and social media sites can play in supporting improved knowledge creation and sharing at a societal level12. One of the things my fellowship1 is focused on is understanding how we might enhance the ability of Land Grant personnel to more effectively contribute and gather “digital trace” through sociotechnical capabilities like metaliteracy, simultaneously and efficiently supporting both our individual work and collective mission. 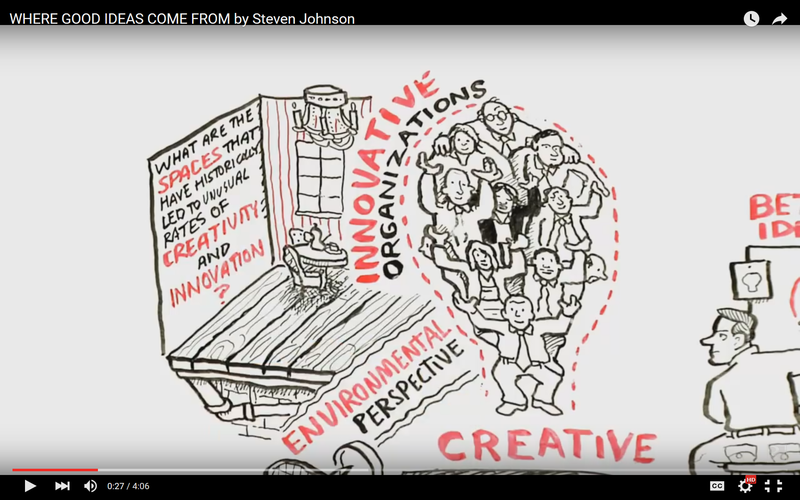 In his book Where Good Ideas Come From: A Natural History of Innovation13, Steven Johnson explores why certain environments seem to be disproportionately better at generating and sharing good ideas. Drawing from science and history he outlines seven distinct patterns which appear again and again, animated in the video below. What he found was that contrary to the common myth of the isolated genius working alone in his lab until that fateful eureka moment occurs, great discoveries often evolve as slow hunches, maturing and connecting to other ideas over time before they’re fully developed. That “chance favors the connected mind”. One of the key components of innovative environments are what he calls “emergent platforms”. Within the biological world Johnson uses the example of coral reefs, but similar patterns can be found in a variety of other environments, including online ones. By providing accessible and safe environments of confluence, and the necessary scaffolding for increasingly sophisticated collaborations, insights and adaptations, these platforms support innovation in a variety of forms, transforming relative deserts into rich and abundant ecosystems through mechanisms such as resource partitioning and reuse, symbiosis, and tight nutrient cycling. “Liquid Networks” also play an important role in the development of innovative ideas and adaptations. These spaces or networks (physical or virtual) allow a diversity of ideas and elements to come together and combine in creative, and sometimes serendipitous or fortuitous ways. One way this happens in dense networks/populations is through what is called “information spillover” (similar to Bednar’s reference to institutional spillover above), where ideas and information are allowed to easily pass across and between domains or areas of interest, uninhibited by disciplinary silos. In my next post, I’ll be sharing my fellowship1 final report with several specific recommendations related to how we can work together on implementing the above ideas within the agrifood systems domain, transforming our Land Grant system into a “socio-technical platform supporting continuous learning and innovation”. On January 19th from 12-1pm Eastern Time I’ll also be sharing those results via an eXtension Zoom webinar. UPDATE -a recording of that presentation and the slides are now available here. This Solving for Pattern series represents one effort to learn and work out loud as I pursue an eXtension supported “Land Grant Informatics” fellowship, exploring ways we might more effectively link people, technology and information in support of healthy people, food systems, communities, and our Land Grant mission. Rittel, H. W. J., & Webber, M. M. (1973). Dilemmas in a general theory of planning. Policy Sciences, 4(2), 155–169. https://doi.org/10.1007/BF01405730. Modified version of paper originally presented to the Panel on Policy Sciences, American Association for the Advancement of Science, Boston, December 1969. This was forwarded to me by a colleague, who correctly noticed that I would be fascinated with this article! Thanks for such an excellent synthesis of the core ideas regarding complex systems, as well as nesting their presentation within a provocative proposal for the future of Land Grant/Extension institutions. I hope your ideas gain traction… (One additional resource worth mentioning is the work of Michael Quinn Patton, which I expect you also know well.) Best wishes with your efforts! Thanks for the note of appreciation Harry -glad you found this of interest! I look forward to future conversations and actions advancing these ideas with folks like you. And thanks for the reference to MQP -though I’m not an evaluation expert his work is very relevant to these efforts.